Leaving San Diego, we headed north up the coast to find a place to camp for the night. We were a little nervous, because we had been told that camping in California was not only expensive, but also booked up months in advance. We decided to pull into San Clemente State Park and see if there were any openings for that night. We were excited when we found out there was! Yay! In fact, there were LOTS of openings. Apparently we were just ahead of the super busy season, and we were also there during the week, which made a big difference. We paid for one night there and got settled (the expensive part still applied…it was $35 a night). We met our lovely neighbor, who happened to be the grandson of the founder of Fleetwood Motorhomes (our RV is a Fleetwood). Crazy. We walked down to the beach, which was just a short walk away. The next day, we moved up the shoreline to Dockweiler State Beach. Dockweiler is located on the end of a runway. An LAX runway. Literally. So, let’s just say it wasn’t the most remote or quiet of campgrounds! I would call it more like a parking lot with electrical posts. However, I wasn’t complaining because we were able to snag a “front row” spot, which meant that the sand from the beach was touching our front tires. So fun! There was a busy boardwalk bustling (say that 3 times fast!) about 10 ft in front of the RV, which made for really great people watching from the comfort of my living room. That night, we enjoyed an amazing meal at the Terra Bella Cafe in Redondo Beach, a raw restaurant owned by Melissa Davidson. I wrote more about it at Happy Foody…here. We had a free day and decided to head into Santa Monica to peek around and of course, we had to have supper at Euphoria Loves Rawvolution, owned by Matt Amsden (raw chef and author). Lovely eats. Read the full scoop here. Later on we ended up at REI, where we got Bella a trail-a-bike. It basically turns your bike into a tandem bike for kids! It’s the best thing we have ever purchased! When we got back to Dockweiler, we immediately hooked it up and took off on the boardwalk. It was super, super windy, so we didn’t last for long…but Bella was in heaven! 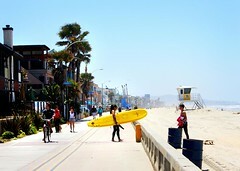 One of the reasons we chose Dockweiler was because of it’s proximity to LAX. We were picking up my sister, Laura, and her fiance, Dan there on Saturday morning! Yay. We set out from the RV and headed in the airport (which was a bit surreal after seeing it in movies so many times). After a few phone calls, we found Dan and Laura and we all squished into the car and headed back to the RV, still parked at Dockweiler. We got everything and everyone situated and headed up the coast. Destination: Malibu. The Malibu Beach RV Park was a welcome sight after the traffic on Hwy 1. Whew! We arrived 15 minutes before check-in time, and we were turned away…being told that we needed to “just come back at 1″. Grrrrr. There were plenty of sites available to pull into, but they were being difficult. So we pulled the rig all the way back down the hill and parked it on the PCH (Pacific Coast Hwy) and made lunch. Dan and Laura immediately ran down to the ocean…because Laura had never seen it before. We finally got checked in and settled…it was a very nice park and we had splurged a bit by staying there. But it was in the perfect location and had an amazing view. Wow. Apparently, this is the same RV park that Matthew Mcconaughey stores his beloved Airstream. Fun little fact. We packed back in the car and headed through the hills over to WorldFest. WorldFest is a large earth-day type gathering, with a heavy emphasis on vegan activism. It was fun to walk around and see all the booths and eat food at the yummy vendors, which included 3 raw food vendors. Heaven! You don’t see that in Iowa One of my favorite things there was the “public display of meditation“. Very odd to see all of these people sitting on the ground meditating in the midst of all the hustle and bustle around them. The Santa Monica Pier was calling our name, and we were off to find it. Dan and Laura are excellent volleyball players and wanted to play in some pick up games on the beach. So we headed there and enjoyed the afternoon watching them beat everyone Next on the list, more Rawvolution. Yum. 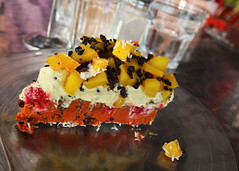 It’s just blocks away from the beach, and we had to take them there to experience the raw goodness. After that, we headed to the grocery store to pick up “Juno” to watch later at the RV (gotta love Redbox!). So funny. Dan fell asleep first. On Mother’s Day, we headed back to the Pier for a day at the beach. Dan and Laura played more volleyball…mostly beating everyone again, but eventually getting schooled by an 80 year old man. Good job guys! Bella fell in love with the playground there…tons of monkey bars and rings. Her favorite. If you’ve never been to the pier in Santa Monica, you must go sometime in your life. There is SO MANY things to see and people to watch…there was never a dull moment. For supper, we met up with Dan’s old friend, Nick (who lives in L.A.)…and we walked until we found a Thai restaurant. Ahhhhh….Thai. 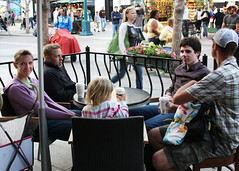 Afterwards, we headed over to the famous 3rd St. Promenade, where we enjoyed some yummy coffee, lively street musicians, and great conversation. Back at the RV, we watched “August Rush”. Wonderful flick! But Dan fell asleep again hee hee. Monday was a wonderfully lazy day. When we woke up, we pulled back the curtains in the bedroom and were thrilled to see tons of dolphins swimming and jumping within view. They continued to jump for us throughout our breakfast of raw coconut pancakes. We headed to the beach shortly after that and set up for a few hours of fun in the sun. We had a passerby tell us that there were sharks in the water and that he was “SURE” he saw them a little ways down the beach. Turns out they were just dolphins But we did proceed with caution… Dan and Laura cooked scallops and asparagus that night and stunk up the RV We had a lovely dinner and went to bed relaxed and ready for another day. Dan left early the next morning to go golfing at the Riviera Country Club in Pacific Palisades and we all slept in. Dan is a golf pro back in Minneapolis, so he couldn’t come to L.A. without golfing!! After making some especially delicious green smoothies, we brought them outside and watched more dolphin action. 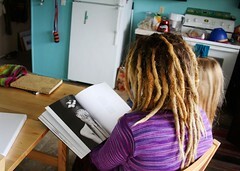 Later on that morning, a new friend came to visit us and have a raw food coaching session. Carrie-Anne found my blog through Emily Falconbridge’s (they knew each other in real life from when Em lived in L.A.)…and she wanted to come see the RV and talk raw food.You all probably know Carrie-Anne as Trinity from the Matrix movie series…of course, it’s hard to imagine her as a latex-clad and gun-toting girl after you get to know her We share a lot of the same passions and had a great time. 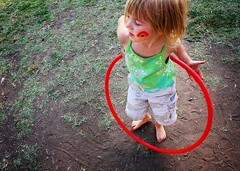 We met up again later at a park near their home before we left town…to hang out and let the kids run free. She brought me the bestest of all gifts…a bag full of fresh avocados from their tree. OH MY WORD. They were fabulous. Later that day, we caught up with Tami…a friend of Becky’s who we had met in Florence, SC back in December. She was living in Carpinteria and working as a traveling nurse…and she had friends in Malibu. We all met up at Dan and Lauren’s house, which was within walking distance to Paradise Cove. We really wanted to surf (well, Matt did!) but couldn’t track down a wet suit for him and didn’t want to rent one. So we just hung out on the sand and enjoyed their company. Dan and Lauren are super sweet people…so laid back and welcoming. We had a lot in common with them as well…I knew I would like them right away because as soon as I walked in the door they were handing me a green smoothie Now that’s my kind of people. 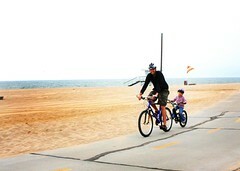 On the last day that Dan and Laura were in town, we headed to Santa Monica again for a demo at the New Roads School. We had a great time talking with the staff and students there about our journey and other environmental issues. It’s so encouraging to see the youth of our nation so concerned and excited about helping the earth. The students were very enthusiastic and fun to talk with. A big thanks to Jessica for bringing us in! We headed to the airport to drop Dan and Laura off for their flight…and with hugs and sad goodbyes, we were off to another adventure. L.A. was amazing. Nothing like we imagined…but everything we needed. We loved it and will definitely go back! After sending my parents back to Des Moines, we headed straight up to Mick and Emily’s house. I have been a reader of Emily’s fabulous blog and was so excited to finally meet her in person! You know how there are some people in your life with whom you just “click” with? Well…Emily is one of those people for me. We share so many of the same passions and she is just an all around beautiful person. Emily and her family are from Australia, so you can’t help but smile whenever she is talking to you. Especially when she is referring to the “rubbish” (trash) . She is also an amazing artist…and her creative spirit comes through in everything that she does. If you are in the scrapbooking world, you may recognize her…she is a contributor to many publications/websites also does workshops and such. Be sure to check out the photo album to see a fews pics of her stuff. It’s inspiring! I’ve never really wanted to be a scrapbooker until I met Em But she’s so much more than a scrapbook extraordinarie…she teaches people how to integrate art into their daily life…and that’s what everyone truly needs! Oh, and do be sure to check out her most recent photos of Italy on her blog…they are breathtaking! The night that we arrived, we had a lovely picnic in a park near their house. The girls ran free while we enjoyed a HUGE green salad and fruit. We enjoyed chatting about the tour and about where the road is leading for them as well. The next evening, we had dinner at their friend’s house. The kids played in the back on the GIGANTIC slide/swingset thingy. We ended up leaving the men so that the “big” girls could go have a pedicure! Yay! 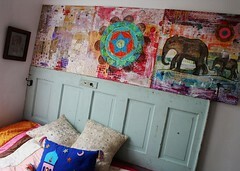 Mick and Emily’s home is decorated in such a fun manner…a little bohemian, a little funk. I LOVE it. I could have stayed and stayed…just to enjoy the atmosphere. They have a lovely little patio in the back…just off the light-filled kitchen. We had a great time chatting and hanging out back there…watching the kids play and create. Being in her home ALMOST made me wish that I was back in a non-moving house again! 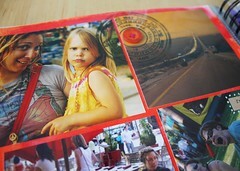 Another fun fact…one of Emily’s best friends is Tara Whitney…one of my very favorite photographers! I had fun peeking around Em’s house at beautiful images Tara had taken. Hopefully next time we get back to the San Diego/L.A. area I’ll get to meet Tara too! Someday I might even go to Thailand with BOTH of them. Now wouldn’t that be crazy? I better start saving my pennies now…Thailand is my dream trip!! And the last bit of fun stuff…Emily has a little side business on Etsy. She creates the most fun and funky camera straps I’ve ever seen. I was soooooo excited when she said she would make me one. Yippeeee! And for all of you photographers out there…Emily gave me one of my favorite straps to GIVE AWAY on my blog. SO…jump on over to this post at Walk Slowly, Live Wildly to enter yourself in the giveaway. And tell all of your friends about her crazy straps. Who wants a boring ‘ol factory strap when you can have one made with love by Emily!? She is constantly updating and posting new and different designs, so be sure to check back often. One thing is for sure…it was too short of a visit! We will definitely be back to spend more time with the Falconbridge family…we miss them already! Photos of all the fun here. This was the first time we had taken on “hitchhikers” during the tour . Hitchhikers named Mom and Dad, that is! Having them ride in the RV with us was such a treat…it was so fun to share that experience with them and see the beauty of the southwest together. The sand dunes and mountains…wow! I had no idea how much the landscape changed in such a short distance. 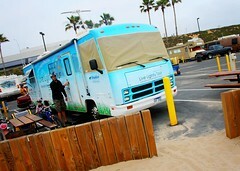 We arrived in San Diego around supper time and headed to our campground. 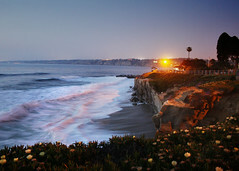 After quickly getting settled, we jumped back into the car and jetted just a few minutes down the road to La Jolla Cove. We found parking and as we walked toward the water…and we were overwhelmed with the beauty of the sunset and the power of the ocean’s waves crashing just below us. It was so quiet except for the sound of the water. I could have stayed there all night…but we decided to venture up the sidewalk and check out the shops and restaurants. 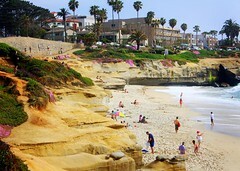 La Jolla is such a neat area, with a diverse mixture of people roaming the streets. The next day, we left early and headed to Pacific Beach and Mission Beach. After seeing the ocean in San Diego…I immediately fell in love with the West Coast. The ocean is soooo different than the east coast…definitely more my style (bigger waves and a bit warmer!). We had so much fun just hanging out on the boardwalk for hours. The people watching could have kept us occupied for days…the surfers, the bikers, the skaters, the vacationers, the volleyball players. It’s so sunny, and everyone is so happy to be out in that sunshine. There is definitely a mix of people here as well…as you can see from the real estate. There are “surf shacks” with run down exteriors and surfboards and wetsuits lined up in a row next to huge, luxurious homes. Someday, we want to come back with our entire family and rent a condo on the boardwalk so we really CAN sit for days watching the people go by . Being in a larger city, I just had to see if they had a raw restaurant…and they did! Cilantro Live! was located not too far from where we were (although nothing is too far in San Diego! )…so we headed there for some lunch. We had a great time trying out all different kinds of raw foods, including desserts! You can read more about what we had on my food blog, Happy Foody. 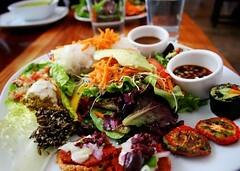 If you have never been to a raw food restaurant…seek one out the next time you are in a larger metropolitan area. They are definitely a fun culinary experience, whether or not you eat a raw diet. 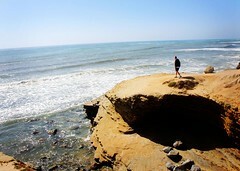 The Point Loma Tide Pools were next on our list. We ended up spending a good chunk of our day here because the ocean was just so captivating! There were crabs to chase, surfers to watch, and apparently there are whales, but we didn’t see any. There are also octopus, sea anemone, sculpin, starfish, lobster and abalone! A little tide pool ecosystem to explore. Everyone kind of did their own thing…mom and I sat and talked, Dad explored off on his own, and Matt and Bella had fun finding sea creatures. It felt so preserved there…like you were at the end of the world. Loved it. We were all getting hungry and so decided to drive over to Coronado Island to grab a bite to eat. We settled on sushi and were able to get a seat on the ocean-front patio! What fun! 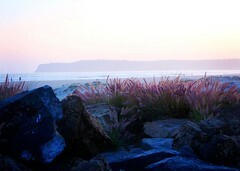 After that, we walked up and down the beach…checking out the famous Hotel del Coronado and all of the busyness around it. There was a big dinner event in the works (right on the beach) and it was fun to peek in on that. Bella fell asleep in the sling…so we kept walking and went to find some coffee to sip while we watched the sunset. The light and surroundings were so ethereal and peaceful…it was hard to pull ourselves away! The next day, we headed to Shelter Island to see the parade of Naval Ships coming into the harbor. And after that, we spent most of the day in and around Seaport Village…taking in the sights and watching the Red Bull Air Race. Wow! Talk about amazing! There were people EVERYWHERE trying to get a glimpse of the airplanes in action. 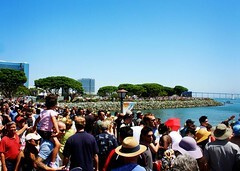 The little area around the bay was packed. We had lunch in the village, Bella got a Little Mermaid painting on her arm by the resident face paint artist and then wandered out to watch the start of the races. Those little airplanes can sure get your heart racing! We wandered down to the Gaslamp District and then headed back the La Jolla “Children’s Beach” to see the seals. The beaches at La Jolla are these cute little things…with cool rocks lining them. We spent a lot of time playing in the sand and watching the skimboarders. The colors of the flowers were so vibrant against the sandy rocks and the blue water. True bliss. Aaaaah. It’s moments like those that I truly remember how blessed we are to be able to see all of these sights as a family. Be sure to click on the photo above and look at it enlarged…it’s like a “Where’s Waldo” photo. Can you find my Dad!? We decided we liked the La Jolla area too much to leave, so we found a cute little restaurant near the water so we could eat, relax, and decompress from our busy day! After that, we made one last trip to Cilantro for dessert…and then called it a night. Back at the RV park, we all went hot tubbing and then crashed! We crammed a lot of things into just a few days…but it was so worth it. The next morning, we loaded up the RV and took mom and dad to the San Diego airport. It was, of course, hard to say goodbye after being with them for so long. We always have such an amazing time when we’re together. We waved goodbye to them sadly, but were excited…knowing that more life-changing adventures were awaiting us. California is just around the corner! 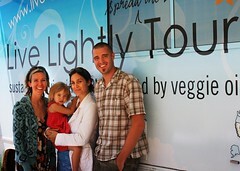 We updated the Route page again, and we will be starting in San Diego on May 2 and will head all the way up the coast. I have been in contact with most of you (I sent out many follow up emails tonight). However, there were a few contacts whose email addresses are coming back undeliverable. If you are Beth or Laura (see below), please email me directly. If I don’t hear back from you, there is a chance that we might not connect…and that would be sad! If you are on our tour route and are interested in booking an event with us…please contact me as well! We are always looking for colleges, coops, and private businesses to stop at for tours/demonstrations. And as always, Sara is available for photography sessions as well.